My theater-buff-in-the-making son and I recently had the pleasure of attending opening night of the National Tour of JOSEPH AND THE AMAZING TECHNICOLOR DREAMCOAT at classically FAB Pantages Theatre in Hollywood and the show was fun, lively and thoroughly entertaining! This show is at the Pantages for a Limited Engagement now through June 22, 2014. 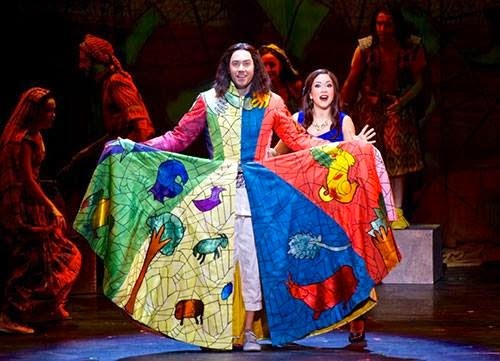 The 2014 National Tour of JOSEPH is starring American Idol Alums, Broadway Stars and husband and wife duo Diana DeGarmo as the Narrator and Ace Young as Joseph. Diana is a seasoned Broadway actress, television star and the American Idol Season 3 runner-up and her husband Ace is also a Broadway star and an American Idol finalist from Season 5. The couple met and shared the Broadway stage in the 2009 revival of HAIR and are thrilled to be sharing the stage again together. 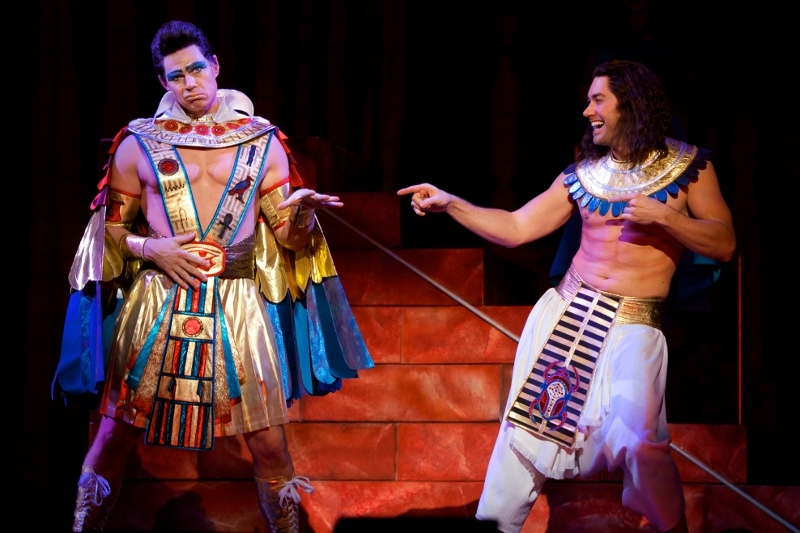 JOSEPH is a family friendly musical about the trials and triumphs of Joseph, Israel’s favorite son. Specifically, this show is a musical retelling of the Biblical story of Joseph, his eleven brothers and his infamous coat of many colors. JOSEPH is the first ever musical collaboration between renowned composer Andrew Lloyd Webber (Jesus Christ Superstar, Phantom of the Opera, Cats) and lyricist Tim Rice (Jesus Christ Superstar, The Lion King) and it is directed and choreographed by Tony Award-Winner Andy Blankenbuehler. This lively musical blends pop, country and rock into an uplifting fun story which has been enjoyed by audiences for decades. My son and I really enjoyed this uplifting show because the story was familiar and it was fun silly and entertaining. We found ourselves laughing, smiling and grooving in our seats throughout the performance. We really enjoyed the modern twists in the show like the Pharaoh/Elvis number pictured above. It is a fun musical for the whole family to enjoy and the perfect one to take newbie theater goers to. I was especially excited to see Diana and Ace perform together in this show since I was a fan of their Idol performances. The two are fun to watch together and have undeniable chemistry. DeGarmo is a seasoned Broadway talent, with a radiant stage presence and a powerful voice and Ace has a boyish charm and exuberance that is fun to watch.